In a food processor, add greek yogurt, chipotle pepper, 1/4 teaspoon smoked paprika, lime juice, and a pinch of salt. Blend until smooth. Set aside. Next, in a small bowl add diced pineapple, red pepper, red onion, fresh cilantro, lime juice, and a pinch of salt. Gently toss to incorporate all the ingredients. set aside. In a small bowl add garlic powder, 1/2 teaspoon smoked paprika, sea salt, and ground pepper. Stir together. Pat the salmon dry and season one side of the salmon, making sure to gently rub the mixture in. Place the salmon on the grill seasoned side down. Grill for 4-5 minutes, or until the salmon releases from the grill. Flip and cook the salmon another 4-5 minutes. Remove from the grill and gently fork the salmon apart into chunks. 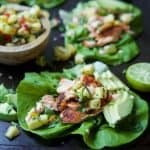 Serve the salmon on a lettuce cup, topped with pineapple salsa, avocado slices, and the Chipotle Crema.